"There is no meaningful alternative to support mass switching. It will be unrealistic for the market to reject the platform outright," Berenberg's Andrew Gollan says. Berenberg kept its buy rating on Boeing, saying the primary factor in the two deadly crashes is the flight control system, rather than the plane. Analysts at Berenberg are calling Boeing a "tough sell" because they see the 737 Max model that had two deadly crashes as "too big to fail" for the company and the industry. "The 737 MAX is Boeing's most important programme, generating 33% of group revenue, contributing over 50% of profit, and with a backlog of over 4,600 aircraft," Berenberg's Andrew Gollan said in a note Wednesday. "There is no meaningful alternative to support mass switching. It will be unrealistic for the market to reject the platform outright." 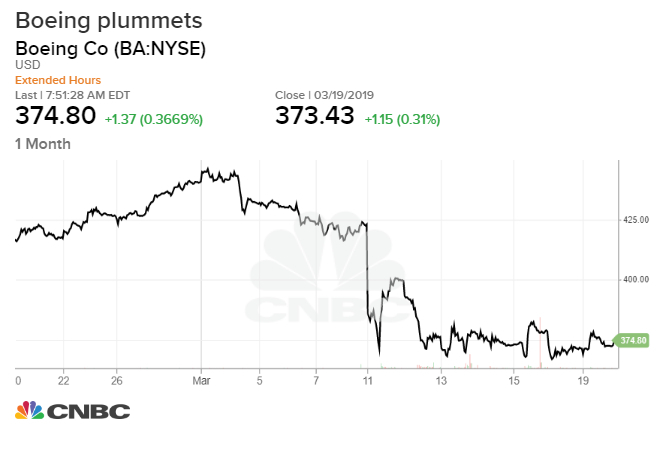 Berenberg kept its buy rating on Boeing, betting that the primary factor in the two deadly crashes is the flight control system, which the Federal Aviation Administration is expected to sign off on the software fix next week. The analyst expect the impact to be temporary and the grounded fleet to be back in service in the third quarter. Ethiopian Airlines Flight 302, a Boeing 737 Max 8, went down shortly after takeoff from Addis Ababa on March 10, killing all 157 people aboard. Aviation authorities around the world grounded Boeing 737 Max planes last week after the crash. Five months earlier, an Indonesian Lion Air 737 Max 8 crashed, killing all 189 people aboard. Boeing stock gained 0.73 percent Wednesday, after dropping 12 percent since the crash on March 10. The stock posted its biggest weekly loss in eight years last week, and the loss has shaved more than $25 billion off Boeing's market cap. "Alongside the Airbus A320, the 737 is crucial for meeting massive global demand for narrowbody capacity over the next decade and beyond. We acknowledge the risk of cancellations in the near term but overall we believe it to be modest," Gollan said. Boeing currently has 5,012 orders of the 737 Max planes, and 4,636 of them are unfilled. Several airlines including Lion Air has reportedly threatened to switch manufacturers in the wake of the fatal crashes. American Airlines, United Airlines and Southwest Airlines are among the top customers of the 737 Max model. American Airlines has 24 Boeing 737 Max planes in its fleet of nearly 1,000 aircraft and it operates about 85 flights out of its 6,700 flights a day using the Max. United Airlines has 14 of the Boeing 737 Max 9s, a larger model, in its fleet, while Southwest Airlines flies 34 Boeing 737 8s that service about 4 percent of its daily flights. "It is certainly possible, in our view, that some airlines will cancel orders, though we suspect this may have as more to do with over-ordering in the past than genuine structural safety concerns," Gollan said.